Could the frequency with which you check your email play a role in causing stress? After all, three-quarters of workers report replying to email within an hour or less of receiving it, according to a recent survey of 503 employees at workplaces in the United States. Checking email less often may reduce stress in part by cutting down on the need to switch between tasks. An unfortunate limitation of the human mind is that it cannot perform two demanding tasks simultaneously, so flipping back and forth between two different tasks saps cognitive resources. As a result, people can become less efficient in each of the tasks they need to accomplish. Michigan-based Aysling, a provider of marketing software solutions and digital media production services, announced it has completed chronicling dozens of issues from the Newsweek magazine library across multiple platforms. The weekly news magazine, founded in 1933, enjoys a global circulation in excess of 1.5 million and readers will now be able to browse through nearly 70 back issues of the magazine on their smartphone, iPad or personal computer. As an Adobe Digital Publishing Suite (DPS) partner, Aysling provided proprietary KickStart Adobe DPS training for the Newsweek staff. Utilizing Adobe Digital Publishing Software (Adobe DPS & Adobe Creative Cloud), Newsweek created their new app and their newest issues are enhanced by video, audio, animation and other interactive elements to fully complete the user’s tablet experience. Aysling teamed with Newsweek staff to build three tablet apps for the Apple, Kindle and Google Play platforms for 66 back issues of the magazine in less than a month’s time. Source: Aysling, Ann Arbor, MI www.aysling.com oron Facebook, Twitter and LinkedIn. I, with my iPhone 5S and my Kindle Reader, may be an anomaly in the world of Apple fans who obsess over the latest features and line up outside stores for new releases even if last year's model works fine. However, it's characteristic of a shift in consumer thinking that poses a problem for the tech industry. Seven years after the introduction of the iPhone that I paid $650 for, mobile devices are closer to commodities than novelties. We now know exactly where PCs are invaluable and where the usefulness of smartphones and tablets begins and ends. As a result, mobile prices are falling, and manufacturers are competing most fiercely at the bottom. The features that used to distinguish new releases are becoming more standard across the industry, pushing down prices. According to research firm IDC, the average price for smartphones fell from $335 in 2013 to $314 this year...and...are projected to sink to $267 by 2018. Drooping margins make it tougher to recover from a misstep within the mobile industry. Presented to an individual within the RV industry who has made extraordinary contributions to the industry's overall success. 2012 Norm Jacobson Lance Camper Manufacturing Corp.
2011 Sid Johnson Jayco, Inc.
2009 Pete Liegl Forest River, Inc.
2004 Mel Adams Airxcel, Inc.
2003 B.J. Thompson B.J. Thompson Associates, Inc.
2001 Bob Tiffin Tiffin Motor Homes, Inc.
2000 Warren F. Jones Hehr International, Inc.
1993 Allen Yoder, Jr. Jayco, Inc.
1986 Warren F. Jones Hehr International, Inc.
Self-coaching is about coaching yourself. As powerful and effective as professional coaching can be, it is only affordable to less than one percent of the workforce. Coach John G. Agno shares his decades of professional coaching and consulting knowledge to create a better life for many through proprietary self-coaching guides; delivered to your smart phone, tablet, eReader, and computer or via low-cost paperback books. Self-coaching invites and encourages people to reflect through learning by reading and listening to themselves, asking questions and empowering themselves to facilitate their own development and improvement in performance. "Ask the Coach," provides free and low-cost self-coaching resources. These human resource (HR) coaching tools include online self assessments to provide more self-awareness. Being unaware, we unconsciously engage our default behavior. Only when we become aware of something, are we able to make choices as to the action we wish to take. Sometimes, just being aware, allows the problem to solve us--rather than requiring us to solve the problem. Self-coaching tools are about designing and using the information in a way most appropriate for its purpose. Often, coaching tools are labeled with the prefix "coaching" because they are more sophisticated, flexible, adaptable or customized than other standardized, off-the-shelf solutions. Please note that the term "self-coaching" may apply to specific as well as general tools. Terms like "leadership coaching tips," "career women coaching tips," and "baby boomer life coaching tips" may emphasize that these areas are understood and done in a coaching way. Frequent self-coaching keeps you abreast of what's effective in your area of interest. Also, people learn better and are positively motivated when supported by regular coaching. This new self-coaching (via Internet access) using mobile smartphones, tablets, eReaders and laptop computers can be seen as more eclectic, proactive, pluralistic, dynamic, inclusive, differentiating, sophisticated and integrating than previous approaches. When we are disturbed, we lose our bearings, and our perception of reality gets cloudy. When you shake a snow globe, the snow swirls about for a while, but eventually it settles. Moods are similar. There is no question that your globe is going to be shaken from time to time. The more you understand that your thinking determines your psychological experience, the more quickly your snow will settle. My personal experience of the world was and is only a function of my own thinking. As effective as being vigilant about your thinking can be, it isn't as important as seeing how your thinking forms your psychological experience. Once this occurs, you will come to possess both a conscious and an unconscious awareness about how your thoughts affect your reality. Have You Had a Life-Changing Insight? Shaking up Yahoo is an effective change management strategy. In today’s business environment, conventional wisdom has it that the release of new communications technology and online tools has made workers more efficient. Yet new research in the area of neuroscience belies that assumption: while the human brain will try to respond to constant communications, it is not, in fact, wired to stay focused on two things at once. According to a survey conducted by Charlotte-based Apex Performance, workers are almost constantly bombarded with distractions that interfere with their ability to concentrate on a single task. Yet they are not taught any techniques or given any tools to help them cope with the daily interruptions – and disruptions – from emails, phone calls and text messages. In this survey titled, “Attention in the 21st Century,” conducted November, 2012, of more than 300 full time American workers, 70% reported receiving 21 or more emails a day. More than half said they check their email more than 11 times a day, and one-third said they check it every time they receive notification of an incoming message. “That equates to opening your inbox once every 20 minutes,” explains Louis S. Csoka, PhD, Apex Performance President and Founder. “Prolonged focus on one thing at a time is required to efficiently accomplish a task. However, two-thirds of respondents are distracted at least every 20 minutes – and sometimes as little as 10 – by an email,” he adds. A survey done a few years ago by Eric Horvitz, an internal research scientist at Microsoft explored how people dealt with everyday distractions such as email notifications. He found that it took the average Microsoft employee 15 minutes to return to their previous task after being distracted by an email, phone call, or instant message. Thus by viewing the results of the Apex survey through the lens of Horvitz’s findings, it appears that the typical 21st century employee seems to only be focusing on any one task for approximately 15 minutes an hour, at most. Yet 70% of the Apex survey respondents contend their productivity has stayed the same or increased since the adoption of smartphone and tablet technology. “No one has taught them how to stay focused, so they don’t realize what they are sacrificing. Employees need to learn how to get back on task and stay productive despite the inevitable bell, pop-up window or phone call,” says Dr. Csoka. Think you can multitask? Congratulations, you're probably living a lie. Harnessing steam power required many innovations, as William Rosen chronicles in the book "The Most Powerful Idea in the World." Among the most important were a new way to measure the energy output of engines and a micrometer dubbed the "Lord Chancellor" that could gauge tiny distances. 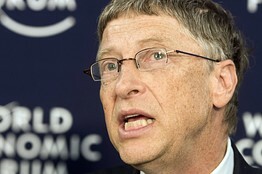 European Pressphoto Agency Bill Gates at the World Economic Forum in Davos. Such measuring tools, Mr. Rosen writes, allowed inventors to see if their incremental design changes led to the improvements—such as higher power and less coal consumption—needed to build better engines. There's a larger lesson here: Without feedback from precise measurement, Mr. Rosen writes, invention is "doomed to be rare and erratic." With it, invention becomes "commonplace." An innovation—whether it's a new vaccine or an improved seed—can't have an impact unless it reaches the people who will benefit from it. We need innovations in measurement to find new, effective ways to deliver those tools and services to the clinics, family farms and classrooms that need them. I've found many examples of how measurement is making a difference over the past year—from a school in Colorado to a health post in rural Ethiopia. Our foundation is supporting these efforts. But we and others need to do more. As budgets tighten for governments and foundations world-wide, we all need to take the lesson of the steam engine to heart and adapt it to solving the world's biggest problems. When Ethiopia signed on to the Millennium goals in 2000, the country put hard numbers to its ambition to bring primary health care to all of its citizens. The concrete goal of reducing child mortality by two-thirds created a clear target by which to measure success or failure. Ethiopia's commitment attracted a surge of donor money toward improving the country's primary health-care services. Last March, I visited the Germana Gale Health Post in the Dalocha region of Ethiopia, where I saw charts of immunizations, malaria cases and other data plastered to its walls. This information goes into a system—part paper-based and part computerized—that helps government officials see where things are working and to take action in places where they aren't. In recent years, data from the field have helped the government respond more quickly to outbreaks of malaria and measles. Perhaps even more important, the government previously didn't have any official record of a child's birth or death in rural Ethiopia. It now tracks those metrics closely. The health workers provide most services at the posts, though they also visit the homes of pregnant women and sick people. They ensure that each home has access to a bed net to protect the family from malaria, a pit toilet, first-aid training and other basic health and safety practices. All these interventions are quite simple, yet they've dramatically improved the lives of people in this country. Ethiopia has lowered child mortality more than 60% since 1990, putting the country on track to achieve the Millennium goal of lowering child mortality two-thirds by 2015, compared with 1990. 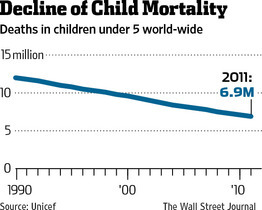 Though the world won't quite meet the goal, we've still made great progress: The number of children under 5 years old who die world-wide fell to 6.9 million in 2011, down from 12 million in 1990 (despite a growing global population). —Mr. Gates is the co-chairman of the Bill & Melinda Gates Foundation and the co-founder of Microsoft. This piece is adapted from the foundation's annual letter from Mr. Gates, to be published Wednesday, January 30, 2013. Plenty of news stories in recent years have noted that American politics have become "deeply polarized." Nearly all of them define and gauge what polarization means in broad terms -- by a breakdown of "red state/blue state," an analysis of "attack ads," or via the endless examples of the "dysfunctional" legislative process in Washington. ...But instead reported on how polarized individuals behave. The most recent episode of the award-winning radio broadcast This American Life did the shoe-leather work, via interviews in many communities and households to discover how individuals are acting and reacting to political differences they have with people they know and in some cases love. The short version: Time and again, this episode of This American Life learned of broken friendships and divided families to an extent no one could recall. I'll mention two of the many examples (one Democrat, one Republican) from the broadcast, which can only be described as open meanness to a friend. A lady learned of an opening in a friend's hiking group -- only to be told by her friend in front of the group -- that she would not be permitted to join because she was a Republican. A man and his friend are married to sisters -- but the man warned the friend not to vote Democrat or he wouldn't serve the friend any barbeque at dinner. Further, the friend would need to bring his own food if he visits. Mind you, these are not hearsay accounts. The radio broadcast played audio clips from the interviews of these people, describing their own behavior. 4) They're acting like the Nazis did [yes, I heard quote after quote saying that]. Now please allow me to zoom out to the big picture regarding the presidential election and the nation's polarized politics, but from a source you haven't heard before. Sage Open is a peer-reviewed journal of the social and behavioral sciences. It has just published the "Elections Paper" I've frequently mentioned on this page. This is an important advancement in the study of social mood's influence on politics. The paper remains available as a free download on SSRN. This is seminal research -- SSRN has posted over 350,000 papers on its website, yet in just 10 months the elections paper has become one of its most-downloaded ever. If you would like to receive the best of Social Mood Watch and other free socionomics content each week, sign up here. This article is syndicated by The Socionomist, a publication of the Socionomics Institute, and was originally published under the headline This is What Polarized People DO to Each Other. The Socionomist is designed to help readers understand and anticipate waves of social mood. Copyright © 2012 Socionomics Institute. Has the Progress of Women Stalled? Q: My question is how to deal with, from a management perspective, the issue of tardiness and absenteeism? I have to admit that this issue continues to be emotionally draining for me affecting both my attitude and that of those around me. A: Many employers struggle with providing performance feedback to correct workplace issues, like tardiness and absenteeism. What’s performance feedback all about? The word “performance” makes it seem as if we are on stage. Success at work is our applause, the managers and leaders of our organization are the directors and producers, and our successful performance run is obviously the bottom line. Very few actors walk away with a Tony or an Oscar for mediocre performances. That is also true in the work world. Survival as an organization rests on the quality of our work. Without stopping to playback our performance, we might find that our run will be much shorter than we anticipated. As leaders, we need to get people on a positive course by helping them face and then manage weaknesses. How this is done is through the feedback process: honestly, respectfully, openly, thoughtfully and with a sense of purpose. How can you offer this person encouragement to change the way he or she has done things in the past? Employees want to succeed in their work. Most accept that goal-directed feedback is an effective means of guiding their work activities to be in concert with team and organizational goals. By having a performance feedback conversation with the tardy employee (where you coach while doing more listening than talking), you can insist that he arrive on time, focus on his work and ask what he will do to make this happen. The impact on the tardy employee will make him responsible for his actions and sets clear expectations. The consequence is he has the opportunity to design a solution to the issue. This situation is an opportunity for you, as the team leader, to build your leadership skills and style. Leadership development is not an event. It is a process of participating in respectful conversations where the leader recognizes his or her own feelings and those of others in building safe and trusting relationships. Leadership is an interactive conversation that pulls people toward becoming comfortable with the language of personal responsibility and commitment. 1. When peers connect change happens. Effective coaching can happen on the dance floor of conversation. 2. It's okay to begin a conversation by confronting the other person with questions that seem awkward but set the stage for a respectful exchange. Why waste time on small talk? Just ask to-the-point information-seeking questions, like: "What are you here for? How do you want to spend our time together?" you are unprepared for and focused on the interests of the other person (not your purpose). 4. Don't get pulled into solving problems that may not matter to the other person. providing answers. When you focus on the solution, you are trying to sell the person something. When you allow people to answer their own questions, they discover what they were not aware of---and what is needed to move forward.